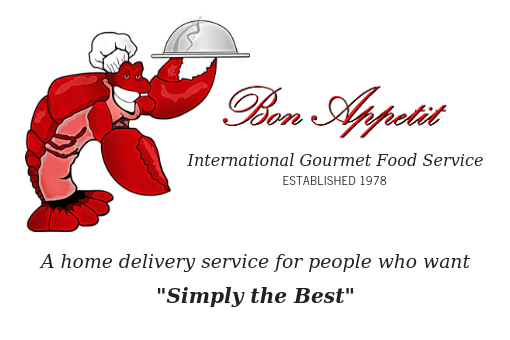 Since 1978, Bon Appetit International Gourmet Food Service has provided five star quality gourmet cuisine to the most discerning homes nationwide. Imagine enjoying top-shelf meals in the comfort and privacy of your own home. Magnum cuts of pre-cooked and glazed crab. This crab is noted for its firm sweet tasting meat, and its so easy to serve: legs are scored so they can be opened quickly. Just thaw, rinse, and serve. These are the lamb’s answer to Porterhouse steaks. They’re the most tender chops on the lamb, and they cook best if they’re thick like ours. The finest and raised in the USA. It looks like a hamburger but it eats like a steak. Trimmings from our steaks are chopped and formed into this very popular lean selection. Great for those special cookouts. This selection will give you the most tender juiciness of pork along with the flavor you remember from fresh pork. Prepare these chops inside or out, stuffed or smothered, you can’t go wrong with this choice. These wild-caught red Argentinean shrimp look cooked, but are actually raw. They have the consistency, texture, and sweet flavor of succulent lobster! These are peeled, de-veined and cleaned, and are ready to be sauteed, boiled or grilled! Our prime flat iron steak is extra tender and juicy with a robust beef flavor that’s delicious grilled, broiled or pan friend. Big on flavor, yet completely trimmed, this trendy steak is one you have to try! Don’t be shy – we love to talk about our food! Receive our newsletter & stay up-to-date on our new arrivals, updates, recipes, and savings!